Google AdWords is an e-commerce store’s best friend. It is a great traffic source that can bring in bucket loads of potential shoppers quickly… If used correctly, that is. The trick with AdWords is not just driving traffic. You might have heard stories of companies spending hundreds of thousands of dollars and not getting any further. That’s because you need highly targeted traffic: a steady stream of potential shoppers that match your target audience. Therefore, you have to know your game when it comes to setting up Google Adwords on your own. Pausing non-performing ads that are ruining your CTR and click-through costs. Ensuring your ads are using compelling copy and good CTAs (calls to action). Then, it is time to dig deeper. Apply these 9 tips to get all that juicy targeted traffic. The more organized your account is, the easier you can optimize for traffic and clicks, maintain your campaigns, and adjust ads for higher-quality scores, which ultimately leads to a lower cost per click. Here’s a diagram of how you should structure your account to ensure it’s performing at its optimum. One of the biggest mistakes people make when starting off with Google AdWords is not organizing their campaigns into Ad Groups correctly. First of all, what is an Ad Group? 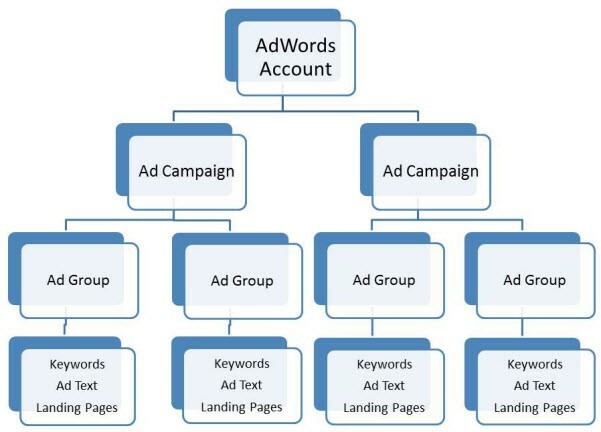 Ad Groups contain one or more ads that share the same set of keywords. Say you walk into a grocery store and see a shelf with bread spreads. The shelf would be your Ad Group, while Nutella and peanut butter would be your Ads. If you throw all the keywords into one ad group, it makes it very unlikely people will click on it. In one ad group, you won’t be able to set different bids for different keywords, based on the best-performing ones. Create ad groups based on the sections and categories of your online store. 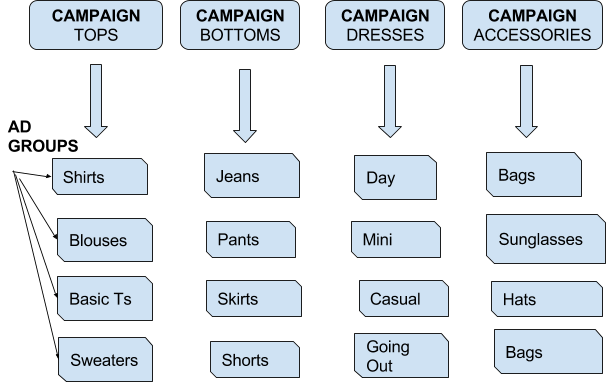 If you sell women’s clothing, you will create a campaign for each of the following: tops, bottoms, dresses, and accessories. Then you will want to break them down into Ad Groups. So under each campaign, you will have several Ad Groups. Organizing your account into Ad Groups helps you show the right ads to the right customers, as you can link every keyword to its relevant landing page or product category. Our CEO Yariv Dror suggests starting with whatever bid you think is good, then see how it performs. If you didn’t spend your daily budget, increase your bid by 10% and wait a day. If you still didn’t spend the budget, increase it again. If you have, then decrease it by 5% and check the day after. Don’t hesitate to start with a lower bid than the Google Planner Tool suggests. You can adjust it later. Since the bids are influenced by various factors, such as industry, seasons, and competition, they easily change over time. Thus, it is a good idea to keep experimenting with them by increasing and decreasing your offering.This method can be the difference between a well-performing campaign with a positive ROI and a losing campaign. Balance is the key to everything, and that applies to Google AdWords too. Conversion Rate (the number of conversions and dividing that by the number of total ad clicks). Quality Score (how relevant your landing page and ad are to the keywords you’ve chosen). New advertisers also tend to overlook Impression Share. It shows the total number of impressions divided by the number of shares your ad was eligible to receive. Say 500 people searched for Bags for Sale, a keyword you’re bidding on, which resulted in 250 impressions. Your impression share would be 50%. Sign into your AdWords account → Campaign → Click Columns Button → Modify Columns. 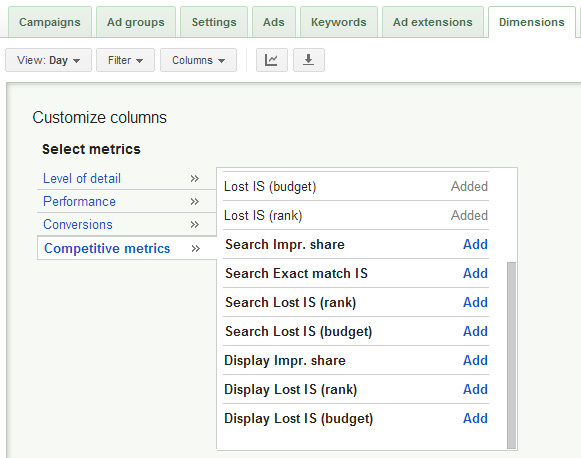 Click Competitive Metrics → Add Impression Share Columns. So why is Impression Share so important? It’s a good indicator of the success of your campaign against your competitors. A lower Impression Share points to the reason, so you can fix and optimize your campaigns. A higher Impression Share means you’re more likely to pay less per click than your competitors and have winning ROIs. If a competitor does move up in ranking, you can use these insights as an opportunity to see what they’re doing differently. That way, you can improve your campaigns. There are four match types (Broad, Phrase, Exact, and Broad Match Modifier) you can use for your Google Search campaigns that determine what keywords you will match to. When you initially set up your ads, Google will default to Broad Match (the main match type). The more relevant the terms you match to your page content, the more people will click, and the higher your quality score will be. To understand when to change the default, here’s a breakdown of each of the match types available to you. 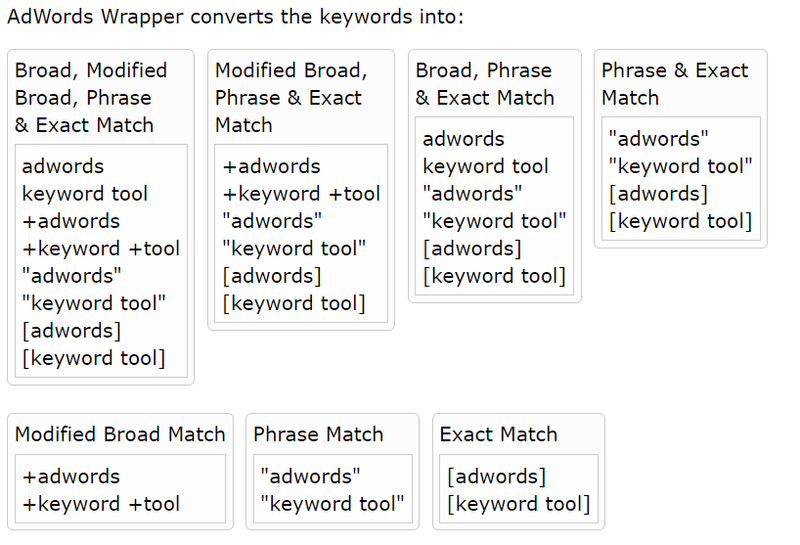 Broad Match is used when the search includes your keyword or a variation on it. It gives Google more control over which of your keywords will be relevant to users’ search queries. More often than not, Google’s algorithm may have a different perspective on what they deem relevant, and they will shoot too broadly. Say you are selling eyeglasses online, and have your ad matches set to broad. Someone types home glasses — in search of kitchenware — then your ad comes up. The user will either ignore your listing or click on it (costing you money), and then click right off, affecting your quality score. Your search ads will appear on more irrelevant searches, meaning you’re spending money on useless ads. It’s difficult for you to write compelling click-worthy ads when you’re casting such a wide net. This match type stands for the case when the search includes the exact phrase of your keyword term with additional words before or after. If your keyword phrase is home glasses, when a user types best place to buy home glasses, your ad is more likely to show. If they type glasses home, your ad will not show. This match type is the middle ground between Broad and Phrase Match. Here you instruct Google on keywords that have to be in the search query, regardless of the order. Exact Match will only show if someone types the exact phrase or keyword terms, and any word order difference or spelling variations will only be picked up if they don’t change the meaning. You will want to use a combination of Broad Match Modifier and Exact Match to get more targeted traffic resulting in better conversions, click-throughs, return-on-investments, and cost-per-click rates, which will help you get the most out of AdWords. 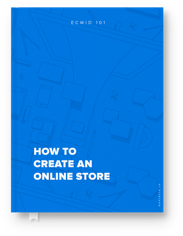 An essential eBook on setting up your Ecwid store quickly and easily. These are essentially words you don’t want to associate with which are similar to your keywords but not related to your product. If you have an interior design store and you sell only wooden furniture, you wouldn’t want people who are looking for a glass table set clicking on your ads. That’s when you can put glass table as your negative word. Google will make sure your ad won’t show up for that specific keyword. If you use as many of the given functions in Google AdWords, you’ll be surprised as to how much time and money you can save. Spend just a little bit of time on these. Trust me, you’ll be celebrating your results in no time. A simple refinement as to which location you want to target can save you thousands of dollars. Say you have a local pizza place. You wouldn’t want Google to advertise it in the whole state when your business is focused only on your local neighborhood. So quickly adjust it to the radius that you think is relevant. Scheduling is another feature that can be very helpful for small businesses. For example, you have a hairdresser salon, and your working hours are from 9 to 5. You don’t really need your ad to show up between 8 p.m. and 7 in the morning. You can use Google Reports to see when people are buying from you as opposed to just clicking. Make sure your budget is being used only during those first hours. Finally, you’ll want to have Mobile and Desktop Campaigns. It’s super easy to do, by going to editing tools in Google AdWords and copy-pasting the campaign. Just make sure your mobile campaign is optimized by selecting keywords that are most relevant to mobile users. The Dynamic Keywords feature allows you to automatically customize your ad according to a user’s search query. All you need to do is write a description of your business and product, then let Google choose the keywords relevant to your business. It will match each search query with the best ad’s headline and with the most relevant landing page, doing all the heavy lifting for you. I suggest to use this tool at least at the beginning, and then once you know what works and what doesn’t, you can exclude the search queries that worked from the dynamic ads and add them to a regular static search campaign. Google will continue searching for keywords while you put in better bids for these well-performing keywords. Your ads automatically update to become directly relevant to what the users are searching for. This gets you a higher click-through rate and a lower cost per click. Saves you tons of time if you’ve got a large number of products and need to make unique ads with specific keywords for them. Google lets your ads be longer than the usual search campaign, so sometimes you can get the character count, which is pretty great. Finally, Google bolds its dynamic keywords, which makes your ads stand out. A powerful practice for improving your conversion rate is remarketing. It puts a piece of code on your website which you can place on different pages of your site. It builds a list of all other people that have visited your website. Go and follow them around the web. You can push your banner advertisement on those websites, exposing your brand in front of their eyes. They can then come back and, just like magic, convert! Or you can store this list for future reference and create a database of users who have visited your site. Mike’s AdWords Wrapper wraps your keyword terms into phrases and exact matches like this: quotation marks (phrase match) and in [square brackets] (exact match). This easy-to-use tool allows you to sort keyword lists and remove any duplicates you have, by entering your full list of keywords, after which the wrapper separates them into lists that you can cut and paste. Traffic Booster is a traffic-driving app integrated with Ecwid that runs your AdWords for you. Its algorithm optimizes bids in real time and matches keywords and ads with the most relevant pages on your site — all in order to get the most effective campaigns at any given moment. You can get the Premium plan for $25 (normally $100). $75 will be added to your first month’s ad budget. This plan includes the setup + management + optimization + ads budget. The final thing that separates the beginners from the intermediates is split testing. By split testing ideas, you can guarantee that the campaigns you run are optimized perfectly for your products and your target audience, bringing in the best results. The smallest adjustment — copy, punctuation, and CTAs — can affect your ROI. The advertisers who take risks on campaigns and test them will win the AdWords game. This can be as simple as testing two similar campaigns, with one using Free Shipping and the other using Best Deals on… to see which one yields the better results with your specific target audience in your specific niche. Use these tips, be careful and patient — and you’ll be able to maximize your ROIs without the hefty PPC agency costs. Anna Kachur is a marketing enthusiast and the inbound marketing manager at StoreYa. She spends her days searching for the newest social marketing scoop and creating amazingly awesome content. When she's not in front of the computer she loves hiking in the outdoors, exploring new places and meeting new people.